Summary: Strange things are happening in Maya's tiny Vancouver Island town. First, her friend Serena, the captain of the swim team, drowns mysteriously in the middle of a calm lake. Then, one year later, mountain lions are spotted rather frequently around Maya's home—and her reactions to them are somewhat . . . unexpected. Her best friend, Daniel, has also been experiencing unexplainable premonitions about certain people and situations. Our review: Yee naaldlooshii. When Maya 16, ventures to Nanaimo, Canada to get tattooed for her sixteenth birthday, a chance meeting with the shop owner's elderly relative has lasting repercussions. The Navajo woman essentially calls Maya a witch and the word stings, even though she can't figure out why. Being called names isn't the only concern Maya has. Living in picturesque Salmon Creek on Vancouver Island, an exclusive medical research town, certainly has its perks but when Maya and her best friend, Daniel, begin experiencing weird things the old lady's words haunt her. Maya's closest friend, Serena, mysteriously drowned, leaving boyfriend Daniel and Maya to console each other and wonder what really happened. When Mina, an out-of-town reporter comes snooping around Salmon Creek bent on unearthing information, she pays particular attention to Maya and Daniel. How come? And why does Salmon Creek want to keep whatever goes on inside its town secret from the outside world? Since I really liked Armstrong's first YA trilogy, Her Darkest Powers, I already knew I wanted to read her next series. 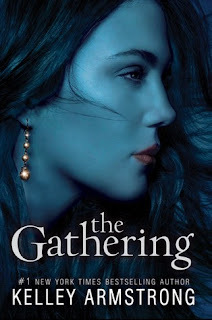 The Gathering is an interesting beginning to this author's latest YA trilogy. The prologue intrigued me and kept me hungry for more. Maya is a strong character, likable, and her background of being adopted by a Haida mom and an Irish father gave her a rich heritage I enjoyed. It was nice to see the main character not stereotyped into obssessing over the town hottie. When the hot new guy in town, Rafe Martinez, showers attention on her, Maya doesn't fall for it. But there is more to Rafe than smoldering looks and when she finds herself being inexplicably drawn to him, it becomes apparent Rafe has more than secrets up his sleeve. In order to understand their mutual attraction, Maya has to figure out if she has secrets of her own too. With the exception of the prologue which hooked me, I found the beginning a bit slow as Maya's world was set up for us. I don't mean my comment in a negative way since this is a given in fantasy and paranormal stories. Throughout this section I developed a keen sense of both Maya and her town as the story progressed. As an animal lover myself, I loved reading about Maya's own fondness and ability to heal animals and the addition of her paw print birthmark was cool and connected well together with the mystery surrounding her adoption and her biological parents. Maya's friendship with Daniel was refreshing, especially her trying to make him understand he can let Serena go and date again. They respected each other and truly cared which is the essence of friendship. I did not sense a love triangle brewing here, thankfully, since I do find this overused device tiring. Maya has a healthy relationship with her parents and is so normal in many ways. As for Rafe, I didn't 'feel' his relationship with Maya rang true, and at times it felt forced. The story does heats up and the pace quickens towards the end when Maya and Daniel go searching for answers on their own. The wildfire scene in the forest was captivating, but there wasn't a sense of immediacy to flee the situation and I also found it confusing at times.While the forest burns around them, Daniel, Maya and Rafe wind up trapped at different times. At one point Maya sees a mysterious man she recognizes, but he disappears creating more questions. I understand this was apparently the set up for the cliff hanger ending, I found the way this first installment comes to a conclusion baffling. Werecats, shifters, Indian folklore, a questionable medical research town and a teen girl's search for her identity make The Gathering an intriguing read. Since I liked Maya's story and want answers to my questions, I will definitely be checking out the next part of this interesting trilogy, The Calling, when it is published. "I took off. I ran across the open field atop the cliff, and quickly realized that was a mistake. He might not be faster than me, but he was fast enough that I could hear him right on my heels. I swerved into the woods. Normally, that's where my advantage lies. Runners are accustomed to open ground. I actually prefer the forest, and I can dodge and dart around trees with barely a hitch in my pace. That's why hurdles are my best event. Rafe fell back a little, but then gained on me when I slowed to skirt thick brush. As we ran, bits of my dream slid back, and everything seemed to get sharper, more vivid. The bright greens of the conifers and the yellows and reds of the rare deciduous trees became a blur of color. Our pounding footfalls muted into the rhythmic thump-thump, thump-thump of a heartbeat. A yowl stopped me short. Rafe's sneakers crunched dry needles as he slid to a halt beside me. "Maya?" Rafe said. "Look up." There, crouched on a branch ten feet above us, was Marv. Something lay at his feet. Something bloody." Cover comment: I like the blue shading but I'm not convinced the model is Canadian Indian. It's an okay cover. Thanks for an honest review. I'm looking forward to this. I liked the Dark Powers trilogy, so looking forward to this set of stories. Having read Armstrong's adult Otherworld series, I was eager to read this one. I enjoyed it, but had the same reaction you did to the relationship with Rafe and with the ending. I liked the nods to characters from Otherworld - the St. Clouds and the Nasts. One interesting thing about the cover, I'm not 100% sure, but I think they used the same model that they used for the last couple of Otherworld books to represent the character Savannah. The resemblance is more noticeable in the cover for The Calling.